Speed-Booster. 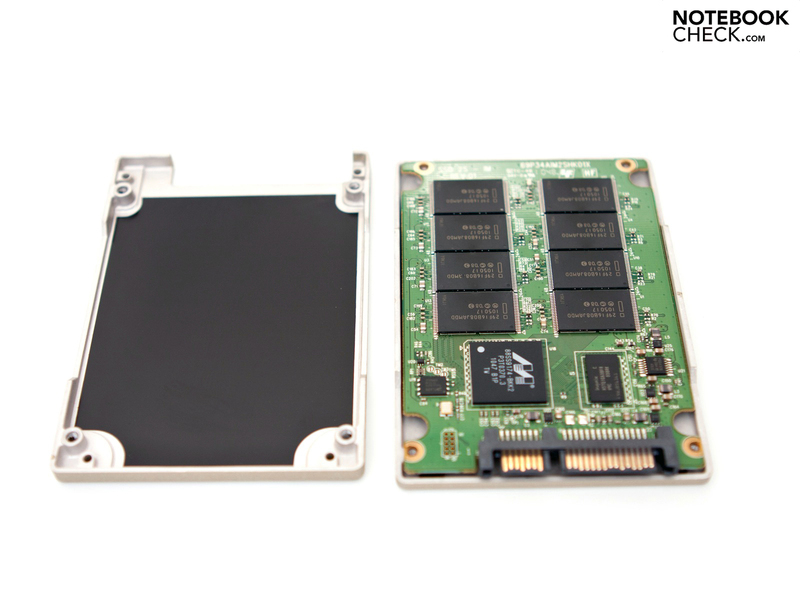 With the SSD 510 series, also known as Elmcrest, Intel have introduced the first SATA 3 Solid State Drives manufactured by themselves that are intended for current devices. The maximum data rate supposedly lies at 500 MBytes per second. The entry model is available now from 239 Euros (RRP). Intel is also jumping on the bandwagon of new SATA 3 Solid State Drives (SSDs, maximum 6 Gbit/s) and presents its new high-end models with the SSD 510 series. 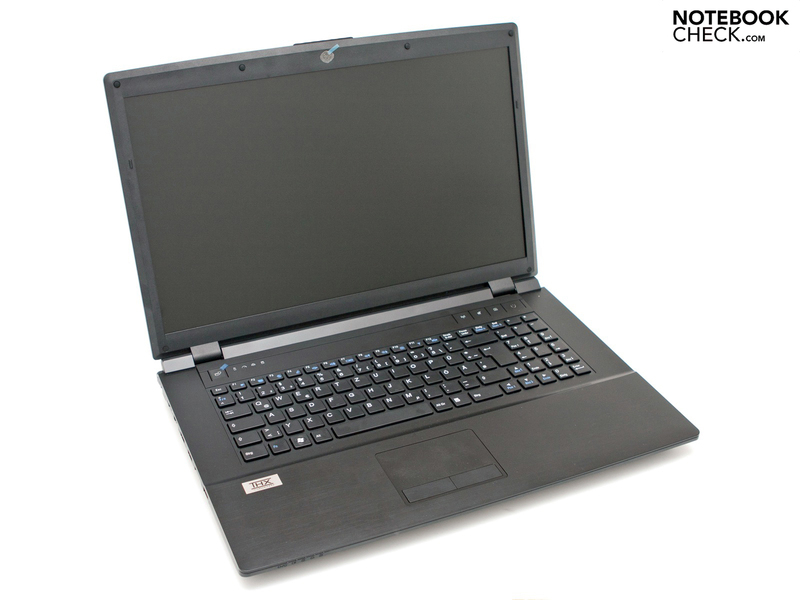 The standard 2.5 inch case contains 120 or 250 GBytes of storage capacity, depending on the model, which are controlled by a Marvell 88SS9174 controller. 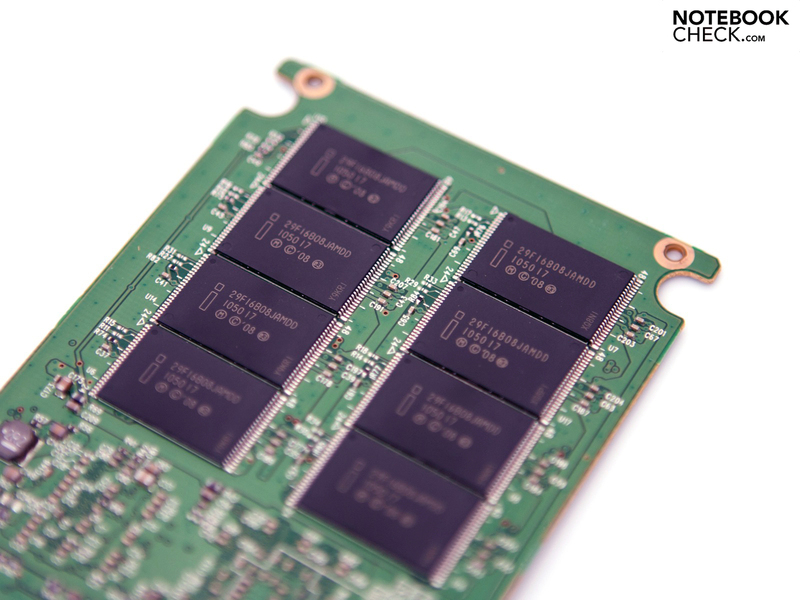 Compared to the recently introduced Intel SSD 320 series, with a maximum data rate of 3 Gbit/s via SATA 2, the 510 series (Elmcrest) only contains the older NAND flash memory with a 34 nanometer manufacturing process. The OCZ Vertex 3 already contains the more modern 25 nanometer components, although this doesn't provide any advantages for users. In the mobile sector only the Huron River platform from Intel currently supports data transfer via SATA 3. 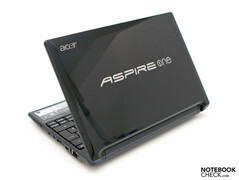 There is currently no notebook suitable platform from AMD that supports this technology. 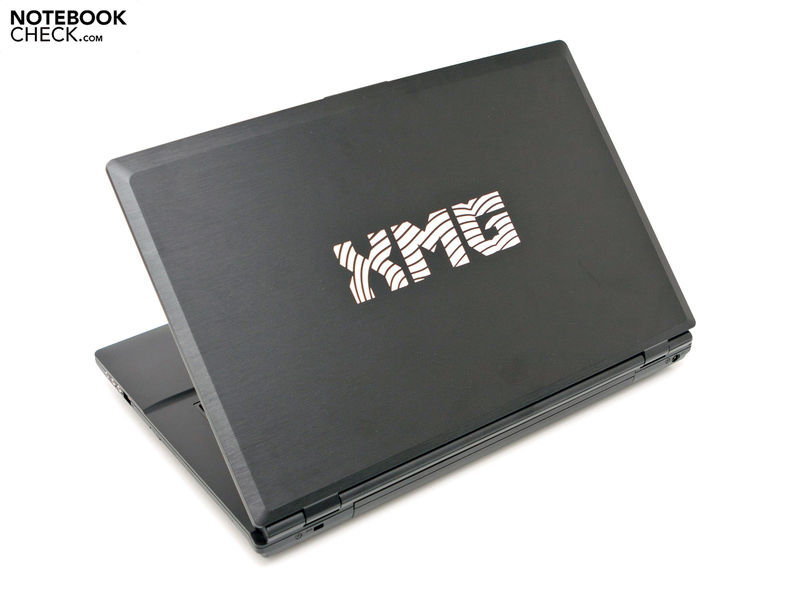 In light of this fact we have opted to use the Schenker XMG A701 gaming notebook with the Intel SSD 510 series top of the range model that has a capacity of 250 GBytes. This shows the series description SSDSC2MH250A2 in the Microsoft Windows 7 device manager, and according to Intel provides for a maximum data transfer rate of 500 MB/s for reading, and 315 MB/s for write operations. The advantage of Intel is the abundant availability of their drives across Germany. Apart from the drive contained in a simple beige case that weighs 80 grams, the retail packaging also contains a complete desktop kit with brackets, screws, and connection cables, as well as a small CD, a handbook, and the obligatory sticker. 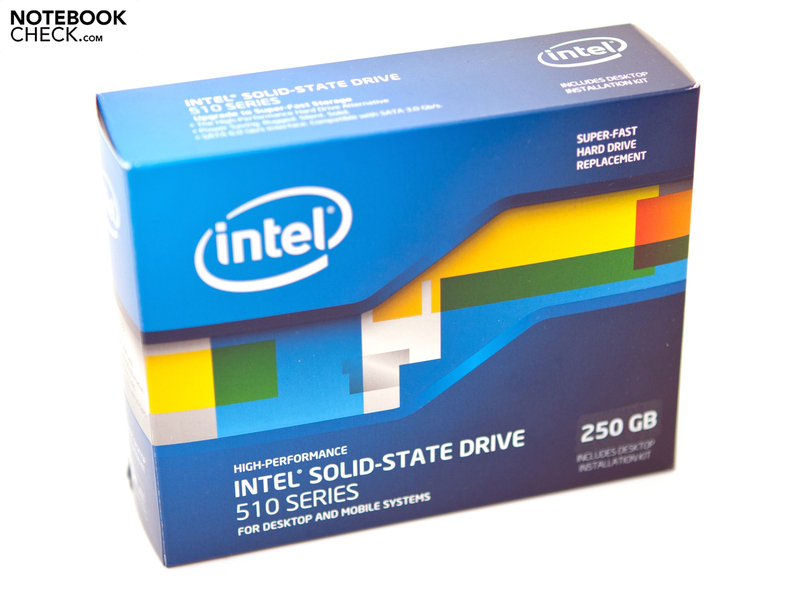 With respect to software the Intel SSD Toolbox is also available. 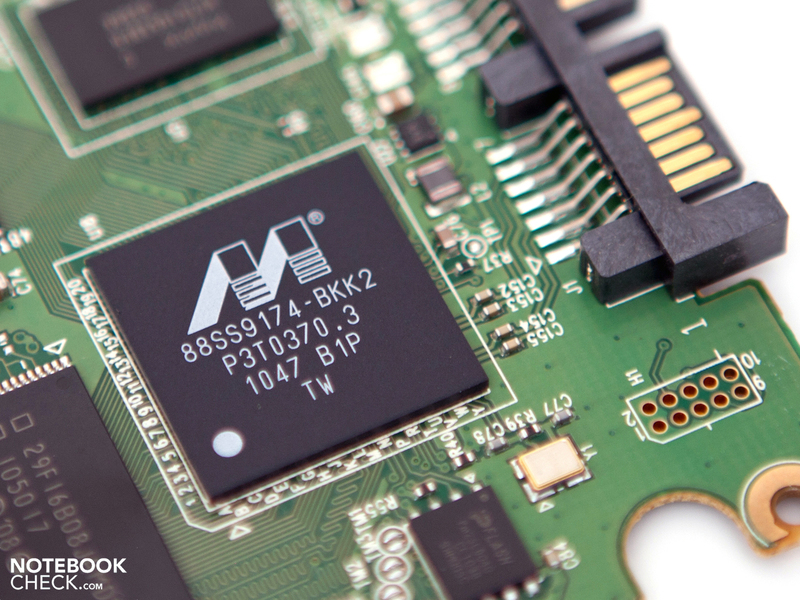 Application examples include the simple performance of a Secure Erase, or a firmware update. 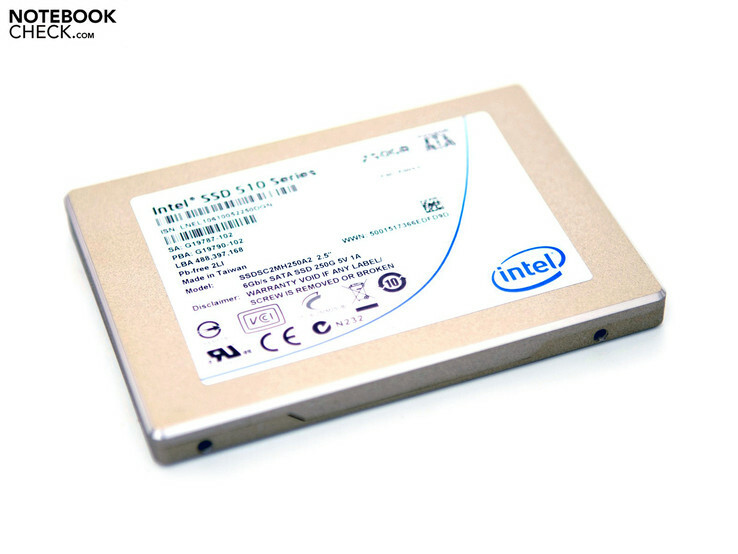 A recommended retail price for the Intel SSD 510 series doesn't really exist, merely the price for the purchase of 1000 units was quoted to us. This lies at 284 or 584 US Dollars per unit. In an up to date price comparison the Solid State Drives are available for 232 and 478 Euros. As with the review of the OCZ Vertex 3 we have opted for the same sequence of benchmarks. 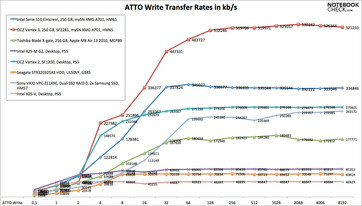 The ATTO Disk benchmark provides reliable results, as well as the foundation for the marketing information from the various manufacturers. 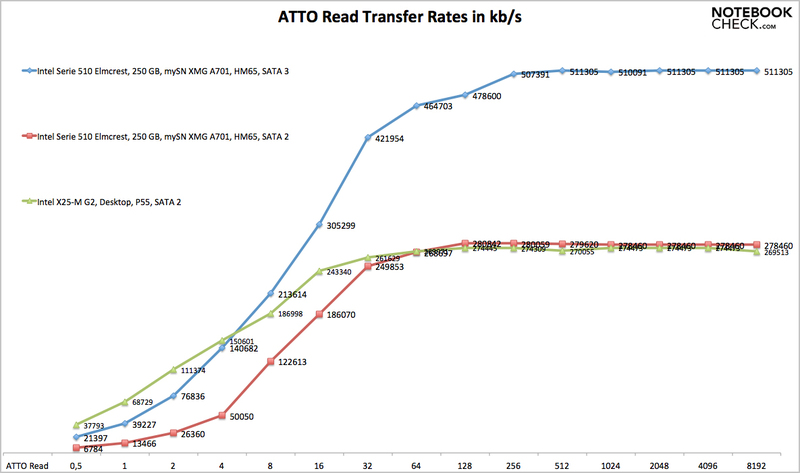 With a maximum read data rate of 511 MBytes per second the first claim by Intel can be confirmed, whereby the smaller drive with 120 GBytes only provides slower read rates. For packet sizes of 8 or 16 MBytes the Intel SSD 510 series is in line with average rates. When it comes to bigger packets the data rate quickly increases up to a size of 256 MBytes, and then stagnates at a high level. 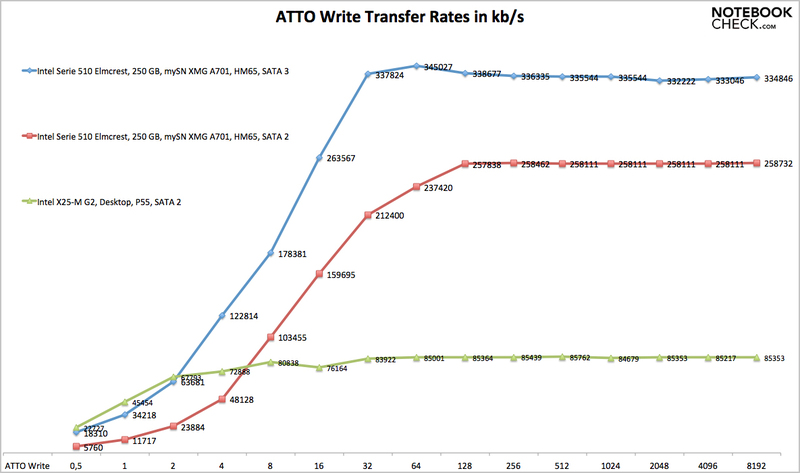 The OCZ Vertex 3 is about 40 MBytes faster at the peak. The immediate predecessor from Intel, the X25-M G2, can only reach a maximum of 284 MB/s in this test. This represents a difference of 44.42 percent. The write operations show the weak spot of the Intel Elmcrest (510 series). With a maximum of 334 MBytes per second the SSD is faster than the claimed 315 MB/s, but cannot compete with the performance of OCZ. 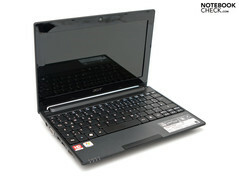 The Vertex 3 lies at around 35.89 percent ahead of the tested model with a capacity of 250 GBytes. The advantage of 17.66 percent compared to the Intel X25-M G2 Postville is clearly noticeable, but not as obvious as we would have hoped or expected. 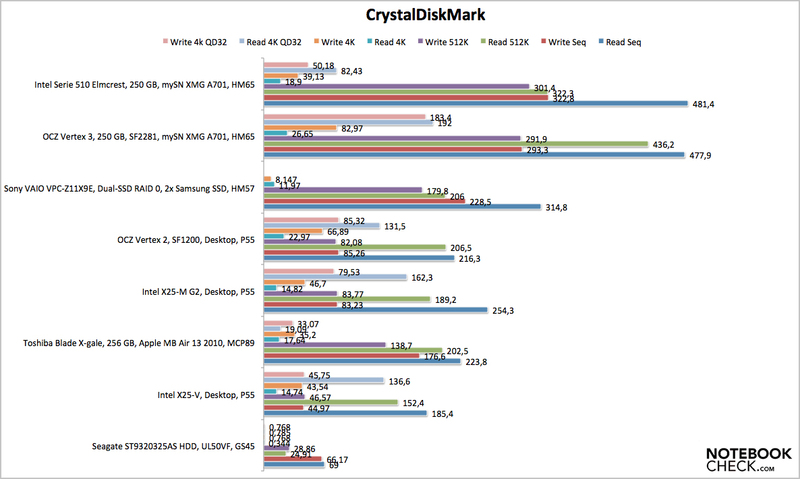 The most comprehensive test performed was CrystalDiskMark, whereby we only took a closer look at the frequently used 4K read and write benchmark. 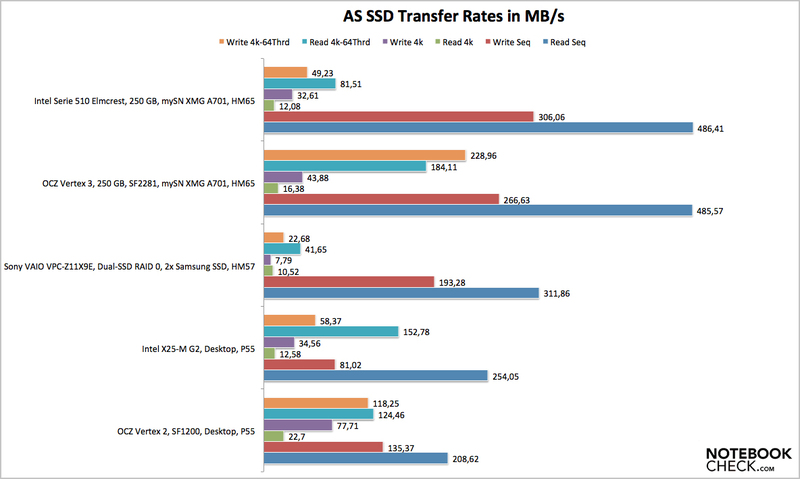 With a 39.13 MB/s read rate, and 18.9 MB/s write rate, the SSD 510 series from Intel isn't able to distance itself markedly from other drives using SATA 2. Apart from the standard hard disc and the faster OCZ Vertex 3, the other Solid State Drives tested by us are more or less on the same level. Merely the write performance allows the 510 series to make it to second place. 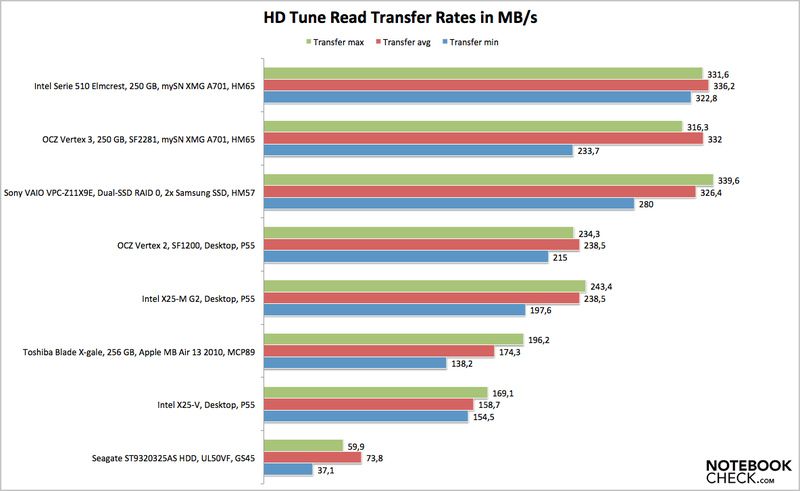 The read benchmark by HD Tune Pro 4.6 already makes things look a little different, whereby this is not directly aimed at Solid State Drives. The results partially vary considerably, which is why we analysed several iterations. 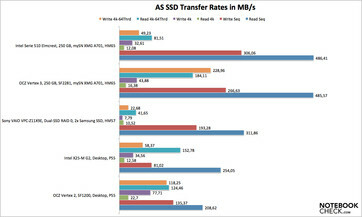 Altogether the SSD 510 series was able to claim the top spot in three of the measurements, and overtook the OCZ Vertex 3 marginally with a maximum of 336.2 MB/s. 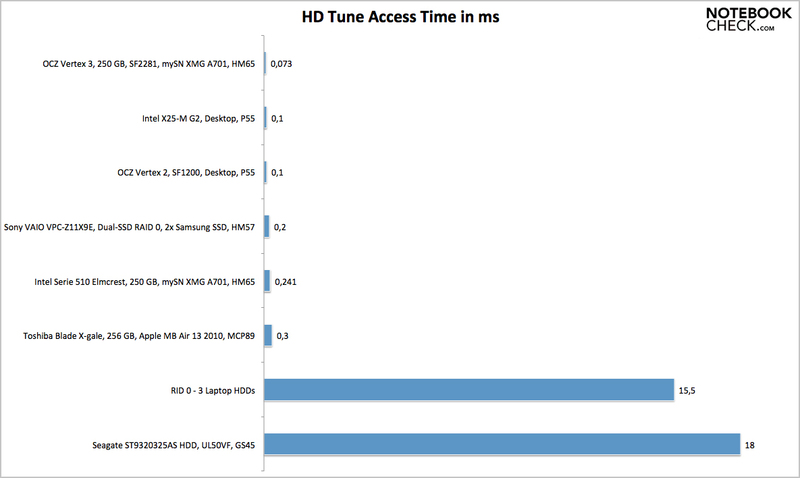 Apart from the data transfer rates the HD Tune benchmark also determines the access times (reading). With a result of 0.241 milliseconds, the Elmcrest positions itself in the middle of the scale of current Solid State Drives. What should be considered though, is that these values are still far from those provided by notebook hard discs (18 milliseconds), and that the noticeable performance enhancement is still maintained. 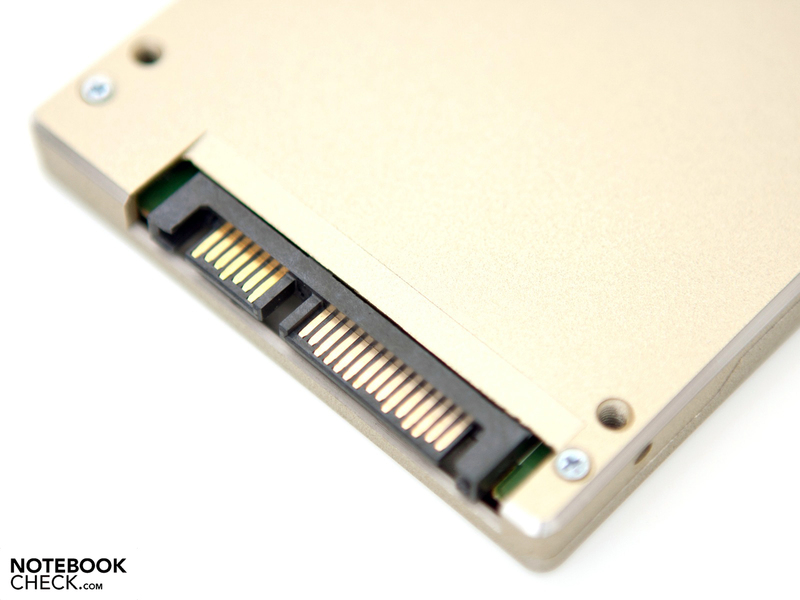 The peak value of 0.073 milliseconds provided by the OCZ Vertex 3, is currently only matched by the Intel SSD 310 series in a mini PCI-Express form factor. 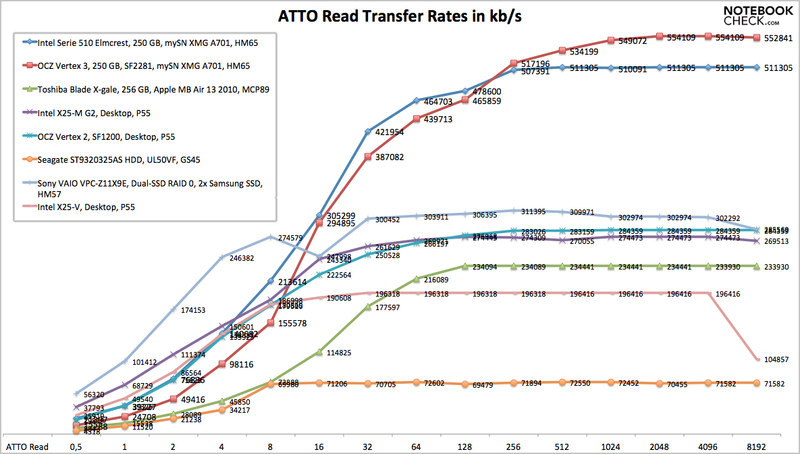 The AS SSD benchmark carries out a test purely for modern drives, and provides reliable measurements. On average the values can be compared to those determined with the CrystalDiskMark benchmark, whereby the results end up a little slower. 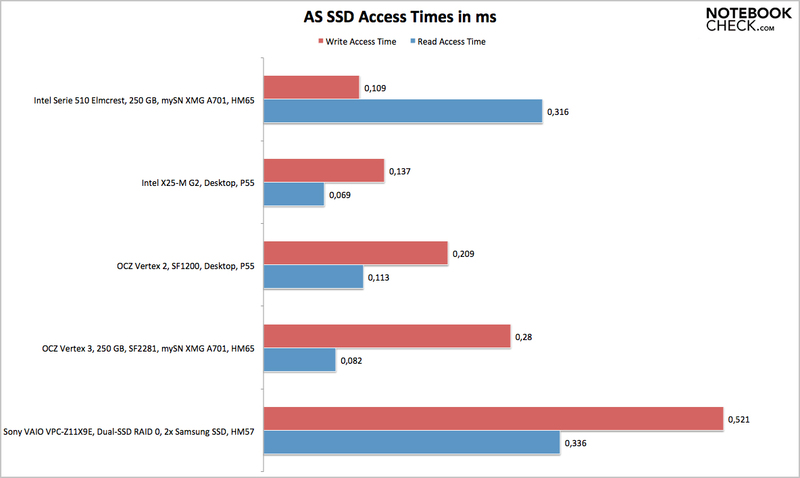 On the other hand the AS SSD benchmark determines read and write access times. A read operation confirms the slightly raised result from HD Tune. Opposed to this is a fast access time for writing. 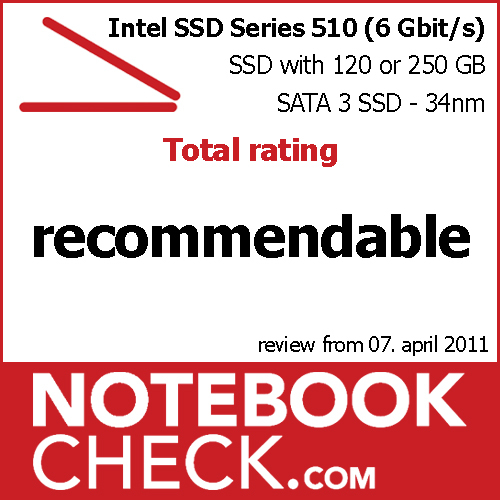 With only 0.109 milliseconds the Intel SSD 510 series can rise to the top in our comparison chart. 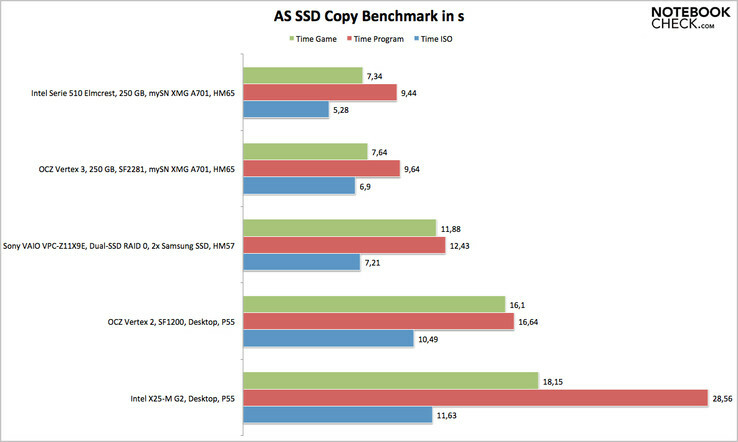 A small but neat additional test is the copy benchmark from AS SSD, which is supposed to represent day to day use. Compared to the OCZ Vertex 3, the Intel Elmcrest with 250 GBytes can reach the top in all three measurements, and makes a good impression. 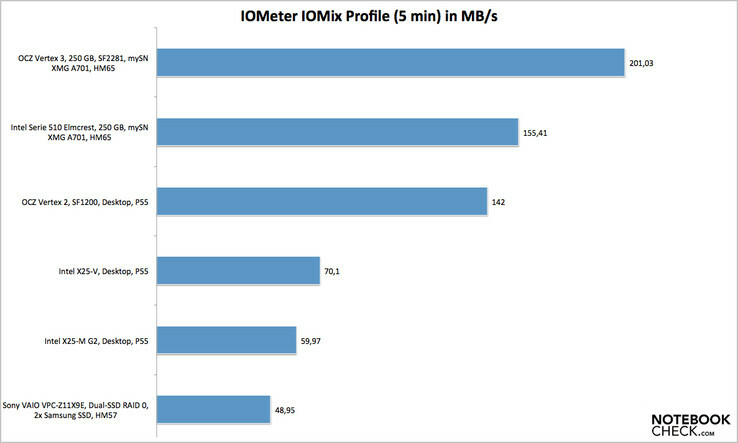 The Intel X25-M Postville in comparison lies at the bottom of the scale. Last but not least we carried out the IOMeter benchmark with the "IOMix" profile. As with the copy benchmark from AS SSD, this profile, which was developed by the c't editorial team, simulates day to day use. Our test duration of 5 minutes showed a relatively similar result. 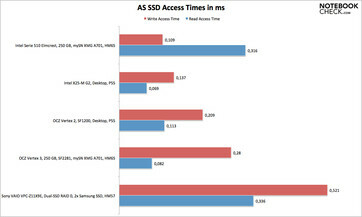 With a data rate of 155.41 MBytes per second the SSD 510 series from Intel can position itself in second place once again, directly behind the Vertex 3 from OCZ. What is conspicuous is the low performance difference compared to the Vertex 2 SSD with SATA 2 connectivity. The difference to the top spot and the Intel X25-M lies at minus 29.35 and plus 61.41 percent respectively. We didn't want to forgo the comparison of power consumption in the case of this drive either. Our colleagues from AnandTech have provided interesting comparison charts in the review of the new Intel SSD 320 series. 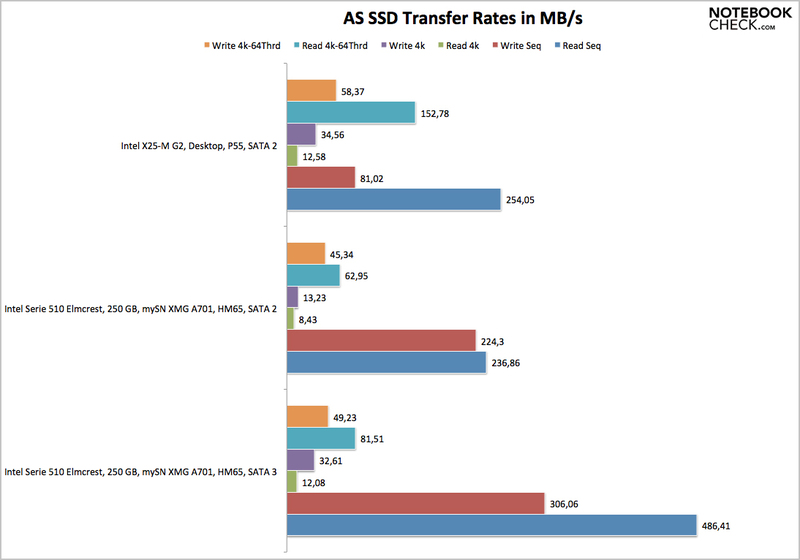 In an idle state the SSD 510 series requires 0.95 Watts, which is significantly less than the comparable Vertex 3 (1.79 Watts), but also more than the new Intel SSD 320 series with SATA 2 connectivity (0.65 Watts). Under load the power consumption obviously increases, and lies between 3.25 and 4.48 Watts. What is conspicuous is the fact that the drive from Intel uses more power under load than the Vertex 3 which has higher transfer rates. Thanks to the standard 2.5 inch case and the backwards compatible SATA connection, the Intel SSD 510 series can also be used in a notebook or netbook with a SATA 2 connection. 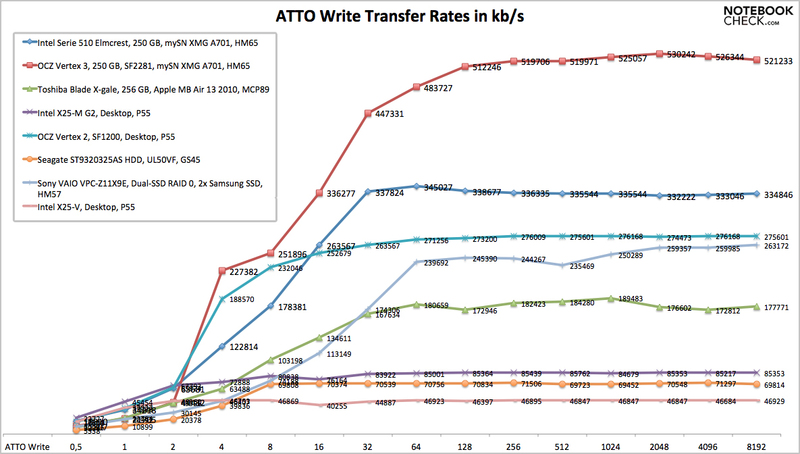 The performance in the ATTO Disk benchmark, as well as CrystalDiskMark, are in line with the broader average. The writing performance even lags behind that of the Intel X25-M, although this doesn't provide any advantages. Further to this the access times are consistently on one level. The newer Intel SSD 320 series should therefore by considered for older devices beforehand. 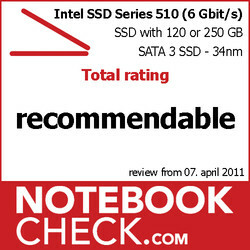 After around four weeks the Intel SSD 510 series left a good impression, although some weak spots have become apparent. 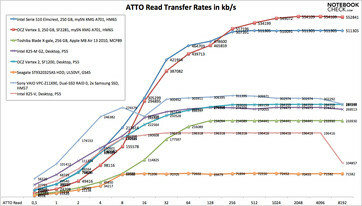 The data rates over SATA 3 with a maximum of 6 GBit/s are more or less in line with the marketing claims of 500 MB/s for reading and 315 MB/s for writing. The access times are also fitting for a Solid State Drive, and fast working without long loading times is possible. Compared to the OCZ Vertex 3 the drive from Intel lags behind in almost all areas though, and thus only manages to gain second place amongst the high-end SSDs. The advantages of the Intel SSD is the currently problem free acquiring of the two offered drives, and the large number of accessories including the desktop kit. 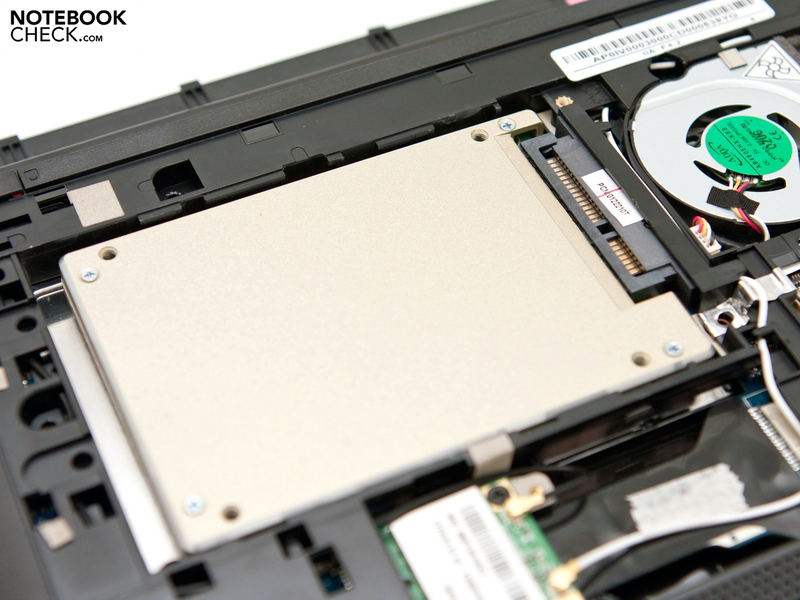 Comparing the power consumption, the Elmcrest is able to impress in an idle state, but under load the power consumption of the Solid State Drive is higher than that of the faster Vertex 3, which could have negative implications for use in a notebook. 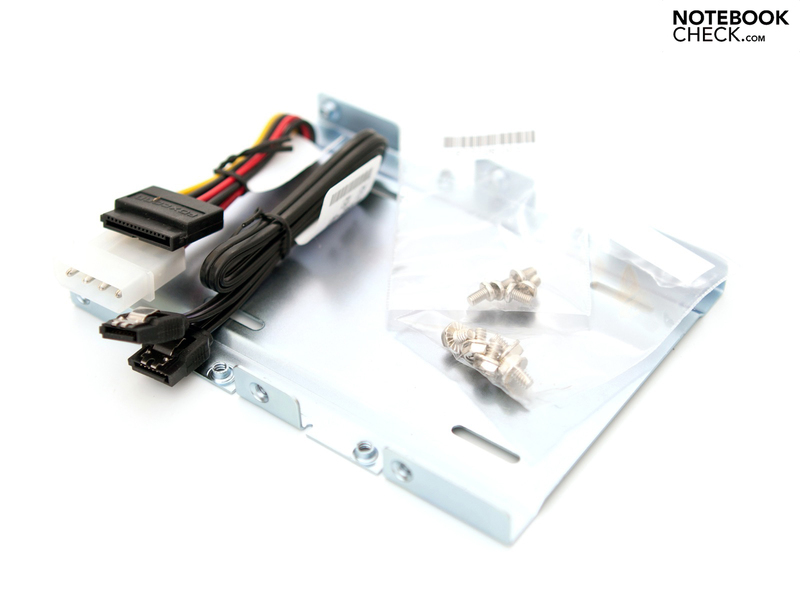 Due to the average data rates, the use in a device with SATA 2 connectivity is only advisable if the use of a device with SATA 3 support is planned in future. 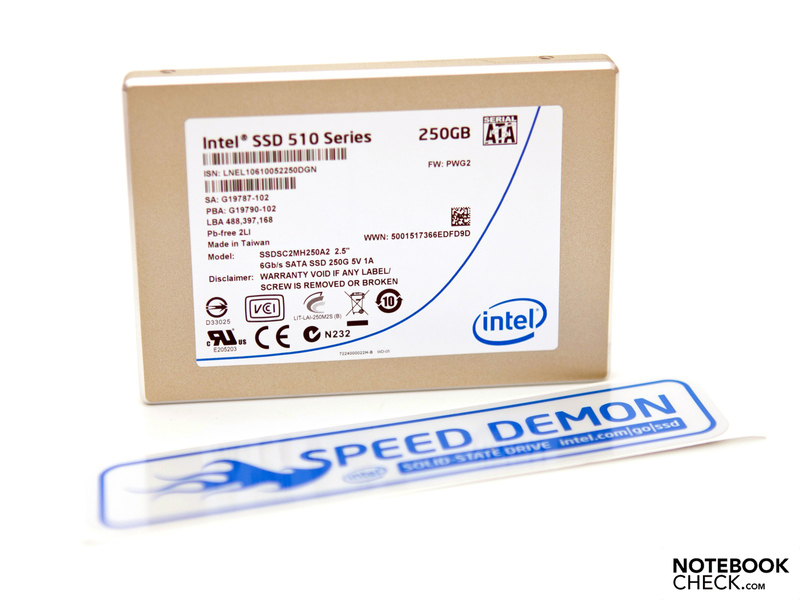 Other than this the newer Intel SSD 320 series with a capacity of up to 600 GBytes can be recommended. An important point remains the price per GByte of storage capacity. The current price for the SSD is around 232 or 482 Euros. This corresponds to a price of 1.93 per GByte, which makes the Intel drive cheaper than the Vertex 3. 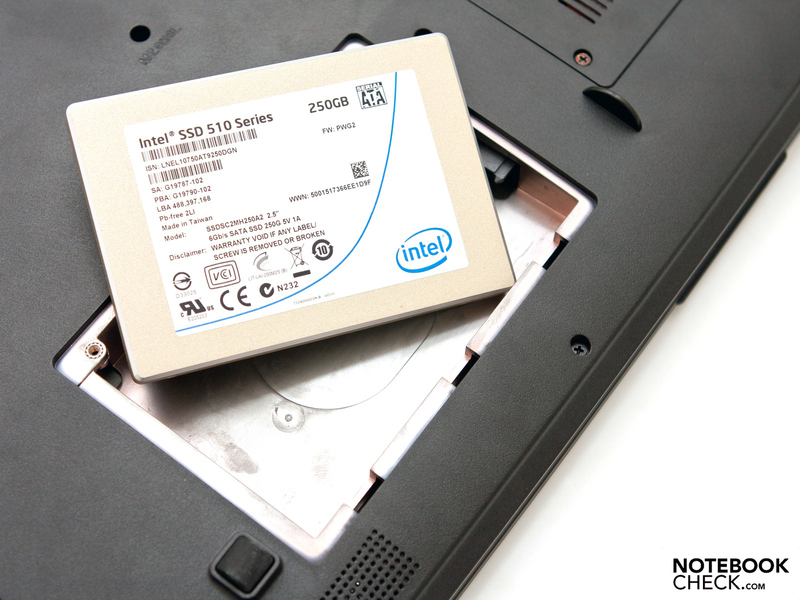 Overall the Intel SSD 510 series is a solid drive with high although not exceptional data rates, an elevated power consumption, and a somewhat relatively affordable price, which leads us to give it a rating of "Recommendable".